This gallery of equipment images is designed to help you identify common types of scrapers, past and present. Slip scraper, or Pan Scraper: The scraper is named from its leading edge scraping the ground to scoop up dirt. The slip scraper, which was pulled by stock, is the oldest and simplest type of scraper. Fresno Scraper: Invented in Fresno, California, the Fresno scraper’s increased width and single handle improved on the slip scraper’s capacity and efficiency. Wheeled Scraper: Western Wheeled Scraper Wheeler. The early wheeled scraper further improved capacity and efficiency by lifting the scraper off the ground and carrying it under an axle. 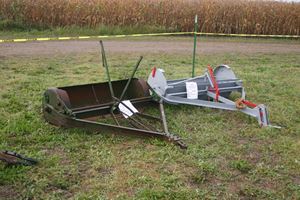 Rotary Scraper, or Tumblebug: This scraper slid on the ground, flipped over to dump its load, and was controlled by a rope handled by the operator of the tractor that pulled it. Mechanized Wheeled Scraper: c. 1929 Baker Maney D. Developed in the 1910s, these scrapers were designed for use behind tractors, one to six scrapers per tractor. Capacity was about one cubic yard. Rubber-tired Pull Scraper: In 1932, R. G. LeTourneau developed the first scraper on rubber tires. It powered by cable from the tractor that pulled it. These improvements became the industry standard. 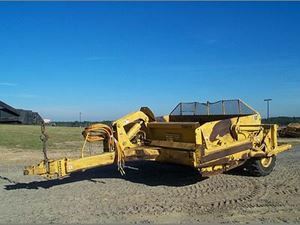 Hydraulic Pull Scraper: 1958 Cat 463. 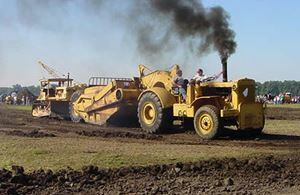 As cable operation of equipment became obsolete in the 1970s, some cable-operated pull scrapers were converted to all-hydraulic control. Motor Scraper: 1940s LeTourneau Super C Tournapull and Carryall. 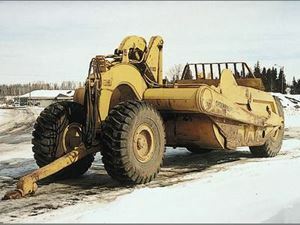 Another of LeTourneau’s standard-setting inventions was the rubber-tired prime mover to pull his Carryall scrapers at higher speeds. Motor Scraper: Euclid TS14. Scrapers often need a push from a tractor when loading. Adding a second engine in the back to power the scraper’s axle makes this unnecessary in most cases. Motor Scraper: 1959 Cat DW20. 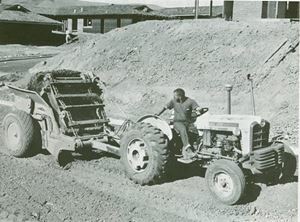 From the 1940s through 1970s, many scrapers were pulled by two-axle wheel tractors. These scrapers could carry larger loads at higher speeds, but were less maneuverable. 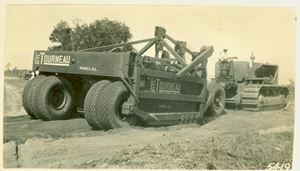 Elevating scraper: c. 1962 Hancock 4R2. An elevating scraper loads itself by sweeping dirt into the bowl by means of slats on a moving chain conveyor at the front of the bowl. 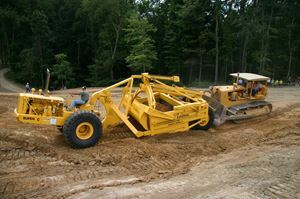 Elevating scraper: Cat 623F. 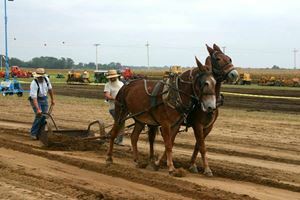 The first elevating scrapers were used in agriculture behind farm tractors. In the 1960s, they began resembling motor scrapers and came into wide use in construction. 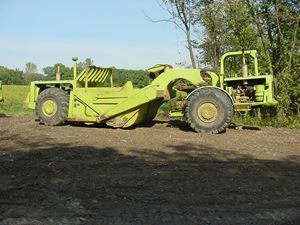 Wheeled scraper: Deere 1812C. 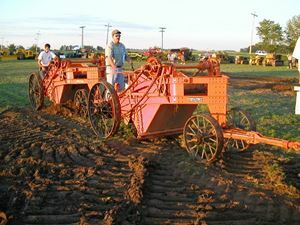 Motor scrapers fell out of widespread use in the 1990s, but tractor-drawn scrapers similar to the wheeled scrapers of the early 1900s became popular in the early 2000s.